Now, I don’t mind having them along on a walk or hike. They are generally well behaved. Unless they see a cat. Or a deer, squirrel, rabbit, duck, goose, bird, grasshopper, snail, ant or, heaven forbid, another dog. Other than that they’re fine. Great company. But managing three dogs and a data collector is all but impossible unless you’re an octopus. 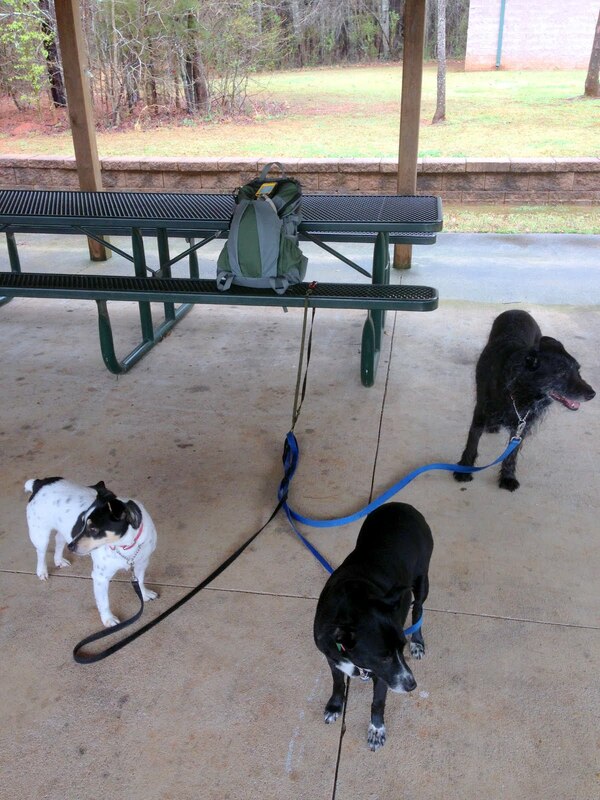 I was in a quandary; how do I take these three amigos along on a data collection hike and get everything done? Well today I had one of those ‘duh’ moments, as in ‘duh, why didn’t I think of this before?’ Just launch the collection job on the Juno, toss it into the zippered compartment in the lid of the rucksack (where it sits up high and the internal GPS receiver should have a fairly good ‘view’ of the sky), hitch up the dogs and start walking! Launch the data collection job on the Juno and go! When I started today’s walk I wasn’t 100% sure how this would work out. 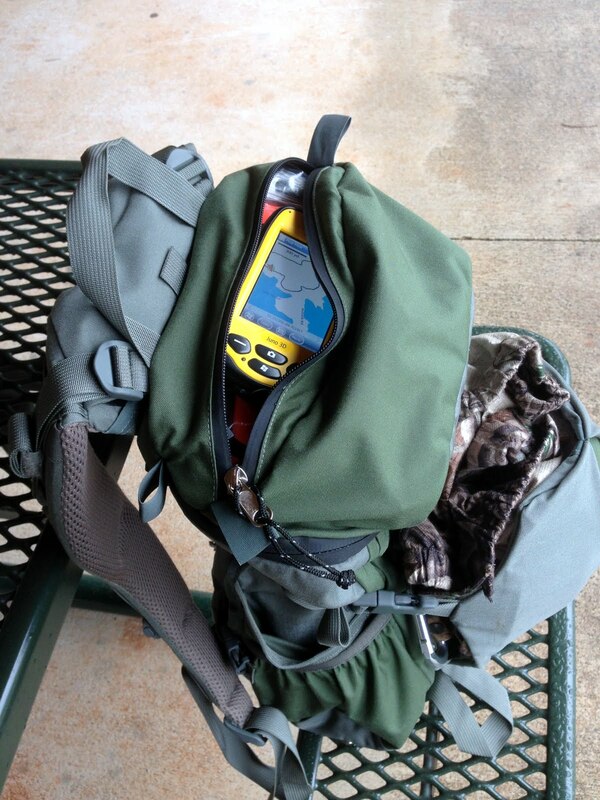 I’ve carried other GPS receivers in pockets on the shoulder straps of rucksacks before, but I wasn’t collecting data with those units. As I walked the trail my mind was working, thinking up all sorts of configurations and contraptions I might use to improve signal reception. By the end of the walk I had myself convinced that what I needed was some sort of pole mounted external antenna. I had it all figured out in my mind – about 4′ of quarter inch PVC with a metal plate epoxied to one end and a magnetic patch antenna (which Trimble makes for the Juno) stuck to that, with the antenna cord running down the tubing and connecting to the Juno inside my rucksack. I could lash the PVC tubing to the side of the pack using the compression straps. Absolutely, perfectly Rube Goldberg-esque! Why it was so clever I’d be the envy of all the neighborhood GPS data collecting kids! Rides nice and high in the pack where signal reception is pretty good! At the end of the hike I pulled the Juno out of the bag and realized I didn’t need all the fancy gadettry I was dreaming up. The Juno did just fine collecting data while sitting snugly inside the rucksack lid. 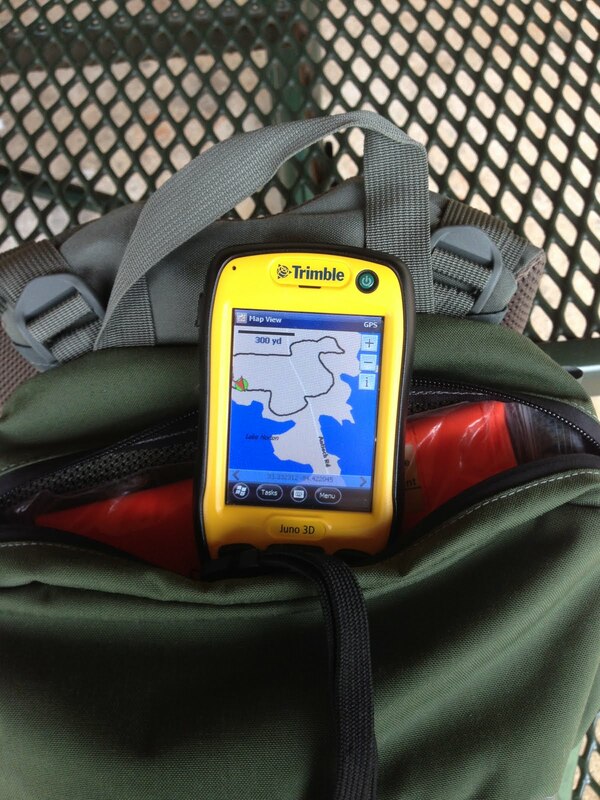 It’s not a perfect setup by any means; the GPS signal still has to penetrate the bag material and my big fat noggin’ blocks a lot of the signals, and it’s impossible to stop collecting streaming GPS data to collect point data. But for hikes like these where I’m just after trail alignments it works fine. The Juno isn’t a survey-grade instrument anyway so some GPS track shift is to be expected, particularly under heavy tree canopy. This entry was posted in General, mapping and tagged juno by Brian Haren. Bookmark the permalink.